My friend was impressed with the Feather and Fan blanket I gave her and asked for a newborn sweater. We knitters are just waiting to knit something, so I readily agreed. 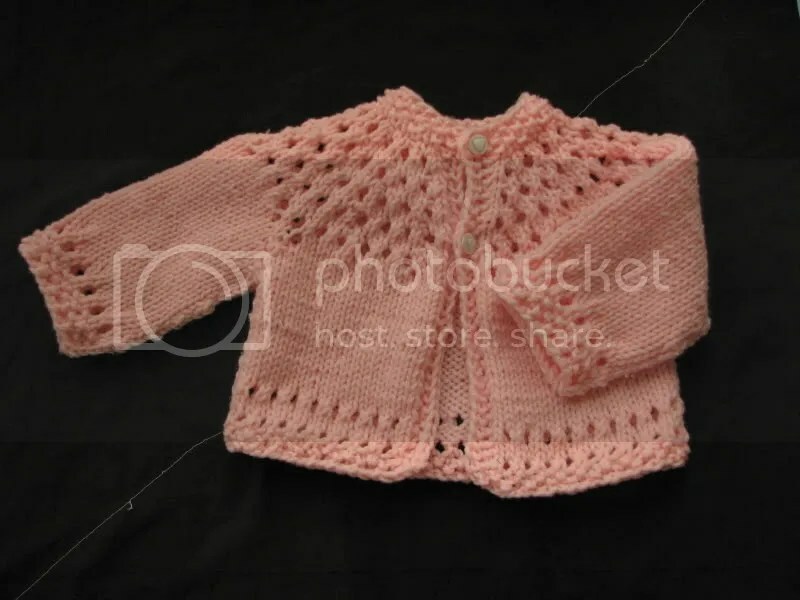 I love the delicate, lacy sweaters which look so cute on girl babies and I always wanted to knit one of those. Unfortunately, I didn’t know any girl babies to knit for. Sanskriti came along and has opened a lot of doors for me. Time was a restriction, so I made this simple, yet pretty sweater for the pretty Sanskriti. There is something wrong with this photograph, the edges are jagged. Because of the black background? The sweater in reality is much better. Really. I am impressed by the construction of this sweater. You start knitting from the neck edge, knit the yoke, divide for body and sleeves, knit the first sleeve (flat, not round), then close the sleeve seam back up so that you are back at the underarm join, knit the body across, knit the sleeve, back at the underarm join and then finish off the sweater. Umm, did it make sense? Never mind. It means you don’t have to break yarn and rejoin yarn for sleeves and body. You have only one loose end to weave in apart from the cast on end. You need a bit of crochet skills for closing the sleeve seam. Hey, does this count as my first crochet project? I guess not. On other knitting stuff, remember that kimono and Twinkle sweater I made? The kimono doesn’t fit yet and the Twinkle is not all that practical. I had to sew on press buttons for the sweater to make it useful. It doesn’t really help in keeping my baby warm, but it does look cute. Sweaters that Rima and Sanhita gave are big and won’t fit yet (intentionally so) so what this means is my little fellow needs a sweater. I search for patterns on Ravelry and the only ones I like are all girlish. I want to knit something that looks like a sweater meant for a boy. Any suggestions? Really nice! Cute sweater. And I am all about top down..and knitting every piece in the round…as much as I can. I hate seaming. It’s very pretty!! Love the soothing colour!! What a cute sweater – I’ve bookmarked this pattern to make for gift knitting. Lovely color too.